Trying to figuring out who’s who is a common human activity. At weddings, funerals, family and class reunions we like to know who we are sharing our time with and what relationship they have—or don’t have—to us. So it is with the church that gathers on Sunday for Mass. Many of the faces are as familiar as our own, but as with any healthy group, new faces are to be expected and welcomed. Some may be visitors, some may be fellow Catholics who have recently moved into the neighborhood, and some may be responding to a faint or fiery call to find out more about Christ and his church. The church opens its arms to these seekers with the wisdom and rituals of the Rite of Christian Initiation of Adults (commonly called the RCIA). People who are seeking to learn more about the Catholic faith and its mission fall into two main groups: catechumens and candidates. (Catechumen is a strange word. It comes from a Greek word meaning “to resound.” The words catechist and catechism are related to it.) A catechumen is someone who has never been baptized; he or she may be an adult, a teenager or a young child (above the age of seven). The journey to the waters of baptism normally takes place over the course of a year. 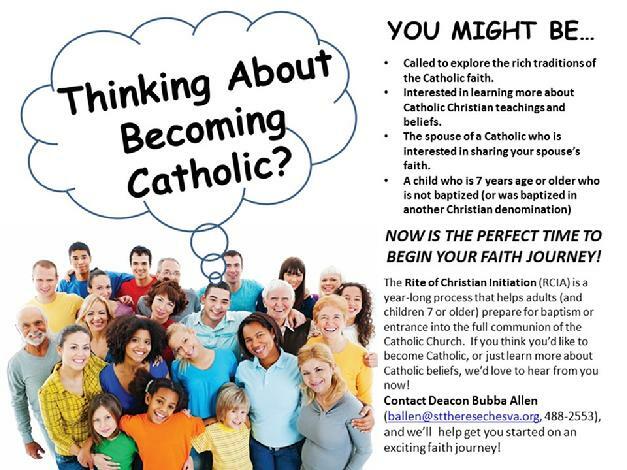 After an initial Period of Inquiry/Evangelization into the Catholic faith, those ready to do so publicly declare their intent to join the church and are accepted into the “order of catechumens.” Then, with the help of catechists, sponsors and the entire community of believers, the catechumens begin to share in the life of the community and do what Christians do: read the scriptures, gather on Sundays with other believers and bear witness to the message of Jesus in word and deed. Often the catechumens are dismissed on Sundays after the homily to continue reflecting on the day’s scriptures. The Period of the Catechumenate is usually the longest period of preparation; it usually lasts at least a year, so the catechumen experiences an entire liturgical year as a catechumen. The liturgical year plays an intimate part in their introduction to the Christian way of life. Lent is a period of intensified preparation, called the Period of Purification and Enlightenment. Lent begins with a ritual when the catechumens who are ready are chosen (“elected”) for initiation. Now they are called “the elect.” At the Easter Vigil, the elect are baptized, confirmed and welcomed to the Lord’s table for the first time. The Easter Vigil marks a high point in their journey—in much the same way that a wedding day is a high point in a couple’s relationship—but, of course, the adventure has just begun! Want to know more? Contact Deacon Bubba Allen. Copyright © 1997 Archdiocese of Chicago: Liturgy Training Publications, 1800 North Hermitage Avenue, Chicago IL 60622-1101; 1-800-933-1800. Catechumens are people who have never been baptized and are now preparing to be baptized, confirmed and welcomed to the Lord’s table at the Easter Vigil through the Rite of Christian Initiation of Adults (commonly called the RCIA). Often there are others who have already been baptized and who now desire to become fully initiated members of the Catholic church. They, too, undergo a period of formation based on the Rite of Christian Initiation of Adults; they are called candidates because they are discerning a call to complete their initiation. Other candidates may have been baptized Catholic, usually as infants, but received no further formation in the Catholic faith. They, too, are preparing for confirmation and first communion. The length of the preparation period varies depending on the background and spiritual needs of the individual. Those who have taken an active role in their church in the past may need a relatively short period of preparation. Others may need a more extended period of formation and catechesis, similar to that of the catechumens. In both cases, active participation in the Sunday liturgy, prayerful reading of the scriptures and an increasing awareness of the church’s teachings and mission are the primary means of preparation. At the end of this period of preparation, those candidates who were baptized in another tradition are welcomed into the Catholic church through a simple act of reception. All the candidates are then confirmed and welcomed to the Lord’s table for the first time. This celebration may happen on any appropriate Sunday during the year. The newly confirmed now take their place in the assembly and continue to do what Christians have done throughout the ages: offer thanks and praise to God and spread the good news of God’s love and reconciliation.